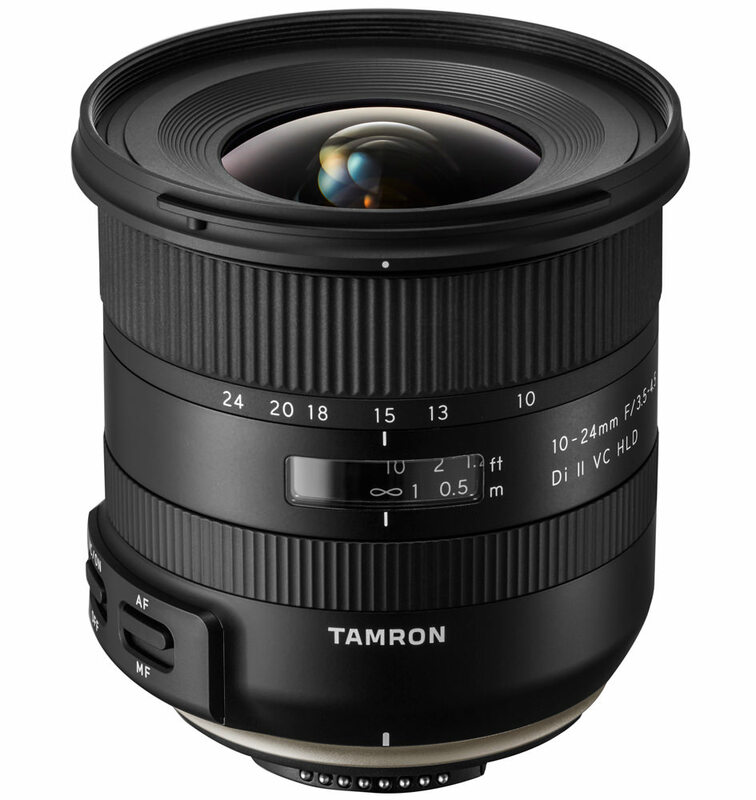 Tamron have announced a new 10-24mm f/3.5-4.5 Di II VC HLD ultra-wide-angle-zoom lens. Tamron has announced the launch of the 10-24mm f/3.5-4.5 Di II VC HLD, a new ultra-wide-angle zoom lens for APS-C DSLR cameras. This new wide-angle zoom lens covers an exceptionally large range-the largest focal length range in its class (Among ultra-wide-angle zoom lenses for APS-C DSLR cameras (As of January, 2017; Tamron)) (35mm equivalent is 16mm to 37mm). The lens is ideal for street photography, landscapes, group photos and casual everyday scenes. In 2008, Tamron launched the SP AF10-24mm f/3.5-4.5 Di II LD Aspherical [IF] (Model B001) that provided an unprecedented focal length range in its class. Building on that lens’s popularity, this new lens has improved optical performance and new features. It embodies Tamron’s most advanced technologies, including the VC (Vibration Compensation) system, Moisture-Resistant Construction and Fluorine Coating, and the first implementation of Tamron’s new HLD (High/Low Torque Modulated Drive Motor). Additionally, this new lens has a refreshing new design derived from the design of the new product lineup in the SP series. The lens is set to be released at the end of March 2017, and pricing is yet to be announced. Also announced was the Tamron 70-200mm f/2.8 Di VC USD G2 (Model A025) telephoto zoom. The lens achieves a broad focal length range of 10-24mm, the largest range among ultra-wide-angle zoom lenses for APS-C DSLR cameras. This is the 35mm equivalent of covering a very wide angle of view, from 16mm ultra-wide angle to 37mm semi-wide-angle. A photographer can enjoy diverse wide-angle expressions with just this one lens, from dynamic landscapes far beyond the normal human field of vision to simple, casual snapshots. The optical design of the lens consists of 16 elements in 11 groups. Special lens elements are utilized in an optimum configuration of one LD (Low Dispersion) lens element, one XLD glass element, one molded glass aspherical element, and one hybrid aspherical lens. While curbing an increase in the size of the optical system, the new lens very effectively compensates for a wide variety of aberrations in the entire zoom range, including transverse chromatic aberration, comatic aberration and distortions that tend to become more prominent with a wide-angle lens. Tamron’s highly regarded BBAR (Broad-Band Anti-Reflection) Coating and the optical design paying close attention to internal reflections in the lens barrel also curb the effects of harmful light rays that tend to occur with a wide-angle lens, achieving excellent resistance against ghosting and flare seen in backlighting situations. In response to the requests of many customers who have asked the company to equip a wide-angle lens with image stabilization, we have now installed Tamron’s acclaimed VC (Vibration Compensation) on the new model. Optimizing the actuator and the control algorithm has made it possible to incorporate the VC, while maintaining the compact design of the previous 10-24mm lens. The VC especially enhances the photographer’s freedom in handheld shooting at dusk or in a dimly lit room, and under other relatively low light conditions, as the mechanism proves particularly effective in the shooting conditions with slower shutter speeds. Tamron’s new HLD (High/Low Torque Modulated Drive Motor) has been developed for use as the AF drive system for this new lens. With its outstanding driving power and stability, the HLD is capable of smoothly controlling the AF mechanism of this new model is actually equipped with large focusing lens elements. When shooting in AF mode, the Full-time Manual Focus override allows you to instantly make fine focusing adjustments manually, without having to switch between modes. While enhancing image quality, adding new functions and substantially improving the basic performance, the new space-saving design has ensured an optimum configuration for components such as the VC and AF unit, thus successfully reducing overall length compared to the previous model. The lightweight and compact body with outstanding ease of use will prove to be very well-balanced when attached to an APS-C DSLR camera. The front surface of the lens element is coated with a protective fluorine compound that is water- and oil-repellent. The lens surface is easier to wipe clean and is less vulnerable to the damaging effects of dirt, dust, moisture and fingerprints, allowing for much easier maintenance. For greater protection when shooting outdoors, leak-proof seals throughout the lens barrel help protect your equipment.